"We’re in a unique period where we’ve got the technology potentially in place to start changing the course for a lot of these species before they go extinct. "This GE American chestnut tree is a Pandora’s box of potential disasters best left closed. A variety of factors, including climate change, disease and habitat loss, are expected to eliminate 15 percent to 40 percent of the world’s plant and animal species during the next 40 years. This has scientists, agriculture industry leaders and some conservationists looking to genetic modification as a way to save, or even restore, some threatened plants and animals. Already efforts are underway to bring back the once plentiful American chestnut tree and to protect a wide range of endangered crops, including the Cavendish banana, Florida oranges and California grapes. As with most things related to GMOs, there is opposition. Critics — including supporters of biotech innovation — worry about unintended consequences of preserving or reintroducing lost species. Activists argue that these efforts are attempts by large agriculture firms to assert greater control over the world’s food supply. Some scientists and ecologists argue that humans are in the midst of an “extinction crisis” – the sixth wave of extinctions over the past half billion years, but this one facilitated in part by humans. Extinction is a natural phenomenon, but the rate of extinction is not. Scientists estimate we’re now losing species at 1,000 to 10,000 times the ‘natural’ background rate, with literally dozens going extinct every day. Through photosynthesis, plants provide the oxygen we breathe and the food we eat — the foundation of most life on Earth. They’re also the source of a majority of medicines in use today. Of the more than 300,000 known species of plants, the IUCN (International Union for Conservation of Nature and Natural Resources ) estimates that about 68 percent of the 13,000 plant species it has identified are threatened with extinction. Among those making a case for considering genetic intervention in this arena is a group of biologists from Idaho State University, who have suggested three options to what they call facilitated adaptation. Create hybrids by breeding a threatened plant or animal with another of the same species, but from a population with better natural defenses against the threat. Use gene modification to take the strengths of one population and add it to another of the same species. Use traits from an unrelated species and add it to threatened species — referred to as transgenic breeding. Ultimately, successful facilitated adaptation will require unprecedented collaboration between organismal, ecological and molecular biologists and climate scientists. Biorepositories — such as seed banks, natural history museums and zoological parks, including the Frozen Zoo at San Diego Zoo in California, which houses around 9,000 frozen cell samples from endangered species—will need to be integrated with advances in biotechnology and efforts to explore the genomic mechanisms underlying adaptive traits associated with climate change, catastrophic diseases and so on. The scientists also highlight the limitations and yellow flags. The genetic techniques work best when a desired trait — resistance to a particular disease, for example — is controlled by a small number of genes. Inserting larger numbers of genes raises the complexity of breeding operations and increases the chances of unintended consequences. Others also point out that there are no guarantees that new GE variants won’t eventually develop vulnerability to a particular threat. Regardless, the idea of using GM technology in defense of a plant is not new. One of the best known examples is the successful effort in the 1990s to save Hawaii’s papaya industry. It was devastated by ringspot virus, which first showed up in the 1950s, but spread through the islands in the following decades. Researchers used genetic material from the virus to reinvigorate the Rainbow papaya, which resists ringspot and now represents nearly 80 percent of the state’s papaya crop. 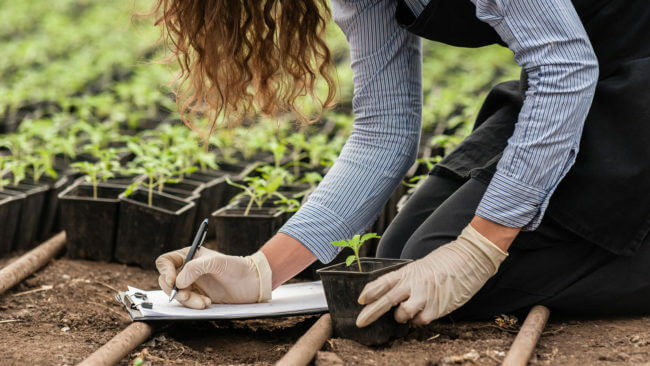 More recently, attention has focused both on plants that face current and future threats as well as some that have already been effectively wiped out by disease. In the latter camp is the American chestnut, a tree that was once a prominent fixture in forests throughout the eastern United States. Trouble came in the 1870s, when it’s believed that a shipment of chestnut seeds from Japan was infected with a fungus — Cryphonectria parasitica. 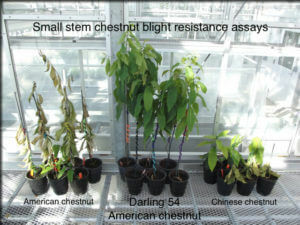 Asians chestnuts are resistant; American chestnuts are not. Within five decades, some 3 billion trees were killed by the blight, leaving only saplings that occasionally rise from the soil before being stricken. After 25 years of efforts, researchers have developed a genetically modified American chestnut that that can resist the disease, using genetic material from wheat. I think if we can’t get this tree deregulated and out in a restoration program, you’re not going to get any genetically engineered tree out. You can’t argue a better tree. Genetically engineered chestnuts and other trees are an unnecessary, undesirable, and hazardous product of the techno-obsessed mindset that assumes genetic codes are like Lego sets that can be engineered to our specifications. The impacts of these engineered chestnuts will be completely unpredictable. Anne Petermann, executive director of the Global Justice Ecology Project, says a revived tree would benefit lumber and paper companies at the expense of the environment. She also criticized suggestions that the American chestnut could provide a source of food, as it once did in early America. 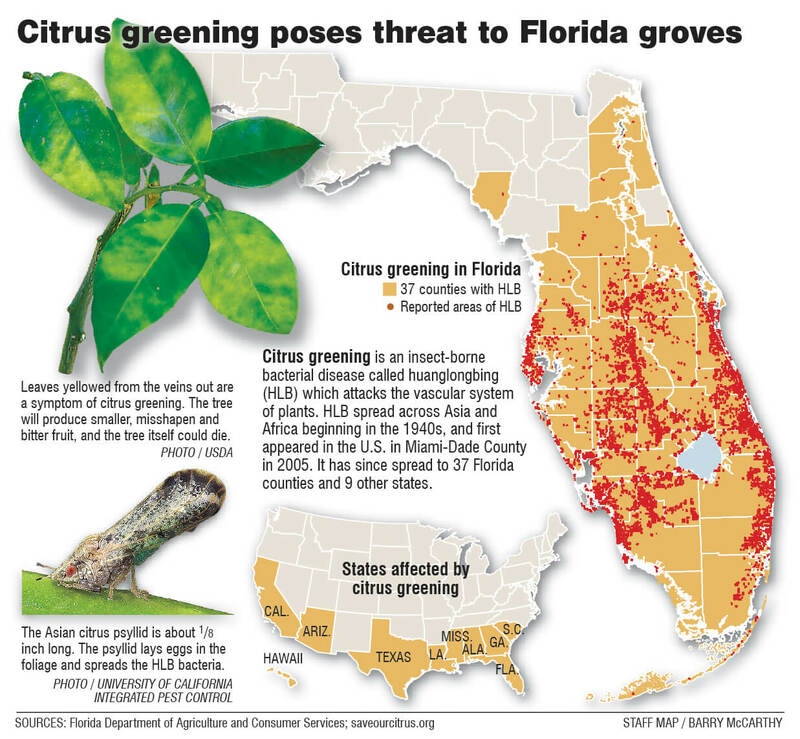 The crisis in the Florida citrus industry, beset by Huanglongbing or citrus greening, may force regulators and conservationists into action. The incurable disease is caused by bacteria that attacks the vascular systems of trees. Infected trees produce bitter, poorly-colored, misshapen fruit. The disease, spread by insects, hit Florida in 2005; it’s resulted in billions of dollars in damages, with production dropping to a 50-year low. The Environmental Protection Agency, in 2015, approved a three-year large-scale test of a new orange tree that resists greening, using genetic material from spinach. Assuming testing goes well and tree receives regulatory approval, it could hit the market by 2018 2018. Like all GMO products, it’s expected to meet resistance from consumers and from other nations that prohibit importation of GMO crops. Still, the initiative has received qualified support from some voices that have stridently opposed GMOs in the past, including Mother Jones. Of immediate concern to African consumers and aid groups are two regional staples—the cassava threatened by bacterial and fungal diseases and the banana, threatened by banana bacterial wilt. GM solutions have been developed to rescue these foods, but opposition from activist groups have scared governments into inaction. 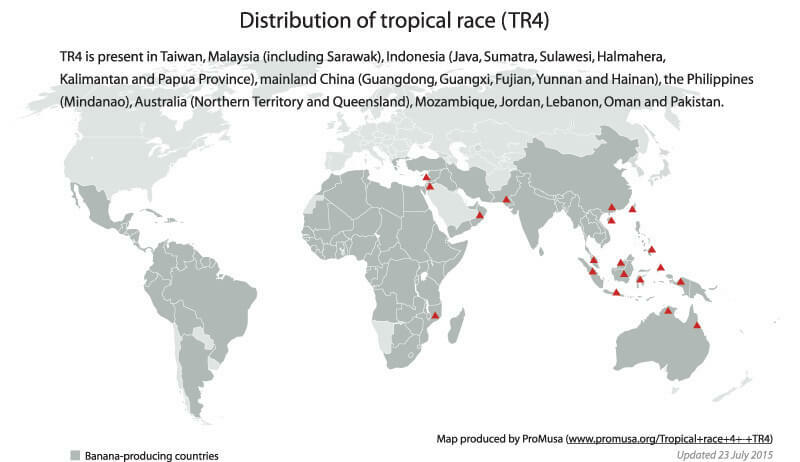 By now, TR4 may have affected up to approximately 100,000 hectares, and it is likely that it will disseminate further — either through infected plant material, contaminated soil, tools, or footwear, or due to flooding and inappropriate sanitation measures. Clearly, the current expansion of the Panama disease epidemic is particularly destructive due to the massive monoculture of susceptible Cavendish bananas. Ironically, we only know about the Cavendish because it replaced the Gros Michel banana, which was, itself, wiped out by Panama disease in the 1950s. There are dozens of banana varieties grown around the world, but most are not exported for a variety of reasons, including flavor, appearance and ability to withstand the rigors of long-distance travel. The problem with bananas like the Cavendish and Gros Michel is that they are grown in monoculture — each is essentially a clone of the same banana. A disease that affects one, affects them all. Saving the Cavendish, proponents argue, will necessarily require some sort of GMO solution. Scientists have developed GE bananas that are resistant to banana wilt and 19 varieties of GE cassava resistant to brown streak disease and mosaic disease.